The new site was just released and the biggest addition is the savings goals function. I want to quickly explain it further to help everyone out. The savings goal is a way for users to set up financial goals that they would like to achieve in the future. They could be long or short term goals and for anything they desire such as holiday presents, a car, a computer, a vacation, or whatever goal you desire. Setting up a goal will help you keep track of your savings towards your particular goal helping you stay motivated and committed to reaching it by the date you set. There are 2 Goals to set up, a Private or Public Goal. A private goal is just for the user to see. No one else will have any access to the goal. This is your own personal goal that you would like to reach. 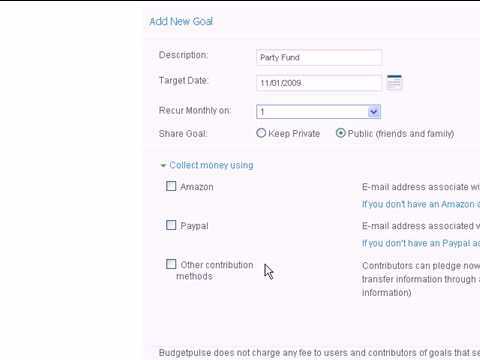 By selecting a public goal a user has the option to email out their goal to friends and family requesting help with raising actual funds. Family and friends can then directly contribute money via PayPal, Amazon, or pledge money to help out. They also can view the progress of the goal as well and the whole group can track together. 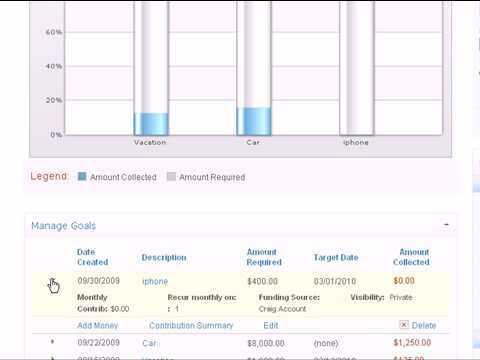 This is also great for organizations who would like to receive funds from multiple people keeping track in one place and having the whole group view how much progress the organization is making with the goal. If you would like to help out your friend or family member with raising money towards their goal, its so simple. You can keep track with them and see who contributed and how much. The whole group can track the progress. I hope everyone gets motivated to saving for their goals. If you have any other questions feel free to see the FAQ or you can always contact me at [email protected] or reach me on Twitter.